5 What Can You Do To Avoid Online Puppy Scams? 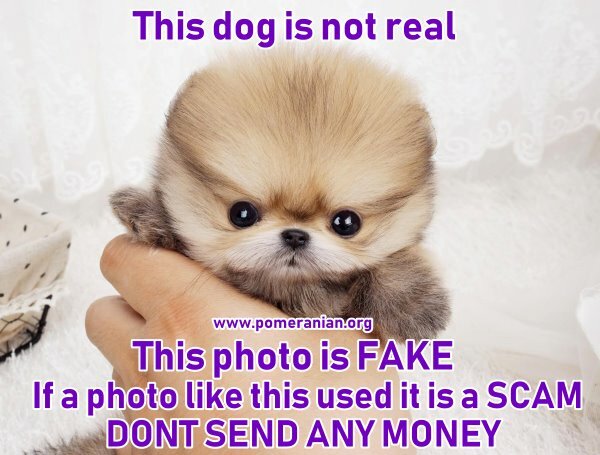 There are many more internet puppy scams around than there ever used to be. It’s partly due to the internet and how people can manipulate information to get what they want, namely the money in your pocket. 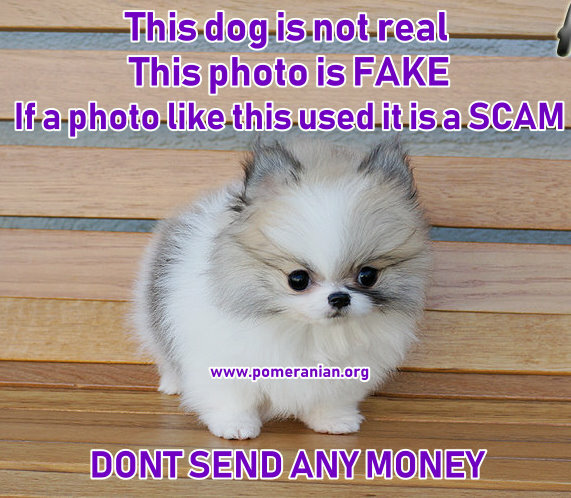 A common scam is related to selling dogs, and is often targeted at people looking at buying a Pomeranian puppy. The dogs are real but aren’t the property of the puppy scammers. 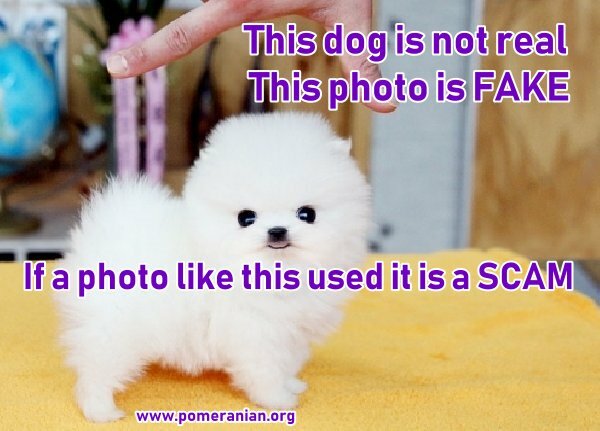 Photos are stolen from top breeder’s websites. Often the photos are photo shopped to make the puppy look very small, extra cute and appealing. 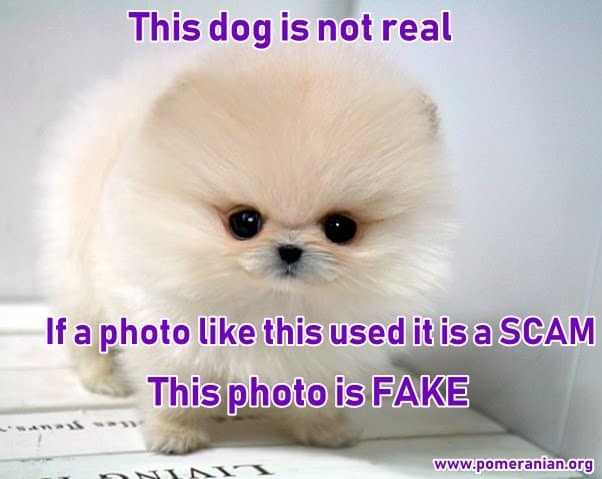 Teacup is a common term used for Pomeranian online puppy scams. Pictured right is a Pomeranian puppy bred by Dochlaggie kennels, Australia. Top photo is the original photo. Below is the exact same image after a few minutes work in photoshop. 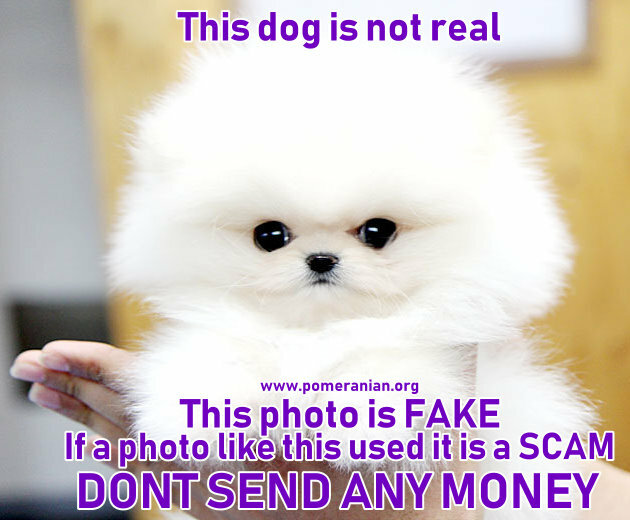 Lots of people love dogs and wish to purchase a cute puppy online, which is one reason why this scam works so well. Put yourself in the shoes of somebody who wants to get a dog to care for. Imagine you don’t really have much money but you want a good quality Pomeranian. So you start looking out for ways to buy your precious dog. You log onto your computer because that’s the fastest way to find what you want. Unfortunately, it’s also such an easy way for others to con you. 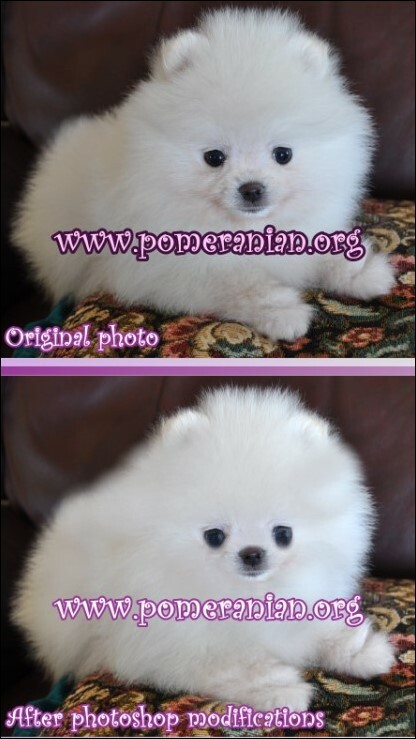 Looking through some ads, you suddenly see one for a white Pomeranian puppy. It sounds great and the photos are amazing. Your heart is already fluttering. Then you see the price…teacup Pomeranian puppies for sale $250. Rubbing your eyes and shake your head in disbelief. Wow!!! You have hit the jackpot. A beautiful white Pomeranian puppy at a bargain price. You should grab it before someone beats you to it. 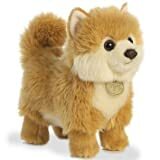 This Pom dog should sell for $1500 or more from a reputable show Pomeranian breeder and this should set off alarm bells immediately. But wait, shouldn’t you investigate further? This is where the puppy scammers outwit you. There’s only ever an email address and the account is usually very new. Photos in the online advertisement are great so you email and ask for more photos. They say they don’t have any more photos because “their camera broke”or some other fake story. It’s actually because they have stolen photos of someone else’s dog on the internet. Naturally you’ll ask why the dog is so cheap. Similar excuses are used. They may say someone in the family is very ill and they need to raise funds for surgery (or some other equally lame, false excuse). Then they’ll say they’re from a different country so you’ll have to wire them the money because their country doesn’t accept Paypal or bank transfers. You’re told they’ll ship the dog to your local airport once they have the money. But IF you’re foolish enough to actually send the money, they’ll just keep asking for more for different expenses such as taxes, custom issues and cargo storage, etc. Suddenly it doesn’t sound so cheap. Ask for the phone number of their vet so you can confirm the details are true. It’s likely they’ll say they can’t give you these pieces of information and then they’ll say they have other interested buyers but want to give you first choice seeing you were “fortunate” enough to have replied first. Ask for information and photos of the puppy’s parents. Google them to see if they exist. Reputable, registered, show breeders usually have a website to confirm they’re legitimate. Check the details to see if it’s the same info as what they have told you. Call the contact number, to see who answers and where they’re from. Only buy through a reputable, registered, show breeder who you can check out. 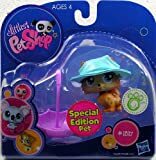 Honest, legit, registered Pomeranian dog breeders will not describe or advertise Pomeranians as being miniature, toy or teacup Pomeranians. 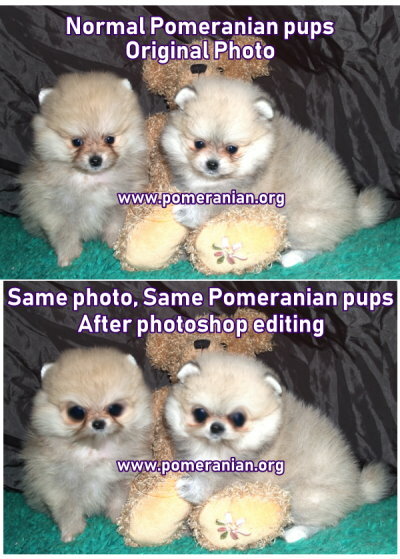 Avoid any “breeder” advertising, marketing or promoting Pomeranian puppies by any of the aforementioned terminology. Ask for references and as much other information as you can. Genuine sellers will also ask you lots of questions because they want to ensure the puppy goes to a good home. Scammers aren’t interested in knowing that stuff so that should also set off the klaxons in your brain. 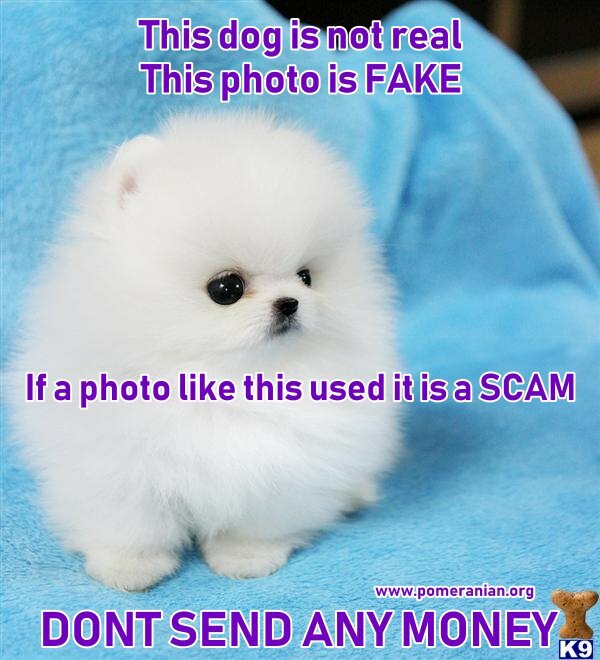 A Pomeranian puppy is a gorgeous pet but don’t risk being scammed because your eyes light up at the thought of owning such a beautiful animal. Be smart and check your facts. It’s better to be safe than sorry. Puppy Scammers are so clever today that they really can get people to part with their money very easily. Make sure that you’re not gullible enough to be one of them. 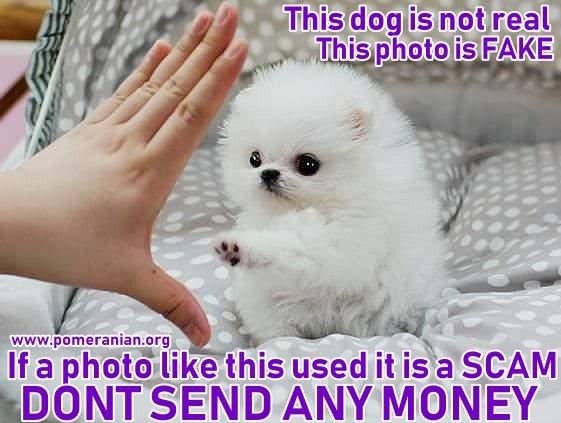 As Pomeranians become more popular, the numerous scammers out there use this to maximum advantage and try to separate people from their hard-earned money. As I come across specific scams, I’ll list them for your protection but there are some things to always watch for. NEVER, EVER pay for your puppy through Western Union. Your money will certainly wind up in the hands of a foreign scammer and you’ll be left with nothing except a sour taste in your mouth. Don’t pay for your puppy with your credit card or by using PayPal. While these are legitimate methods of payment, they can also be used by scammers. All breeders have genuine bank accounts. The only way you can be assured that your money is safe is by paying the breeder directly or into his bank account. Tips that you’re dealing with a scammer who is based overseas include bad grammar and spelling mistakes and the misuse of American and English versions of English. For example: I’m located in Australia and can easily spot the scams by the use of American English. Spelling of mum, is often written as “mom.” Toilet training is referred to as “potty training.” Overseas people simply don’t know the way that Australians talk. If you see ads on free classified ad sites such as Gumtree or the Trading Post, many of them will have prices for their puppies much lower than what you would pay through a breeder. Never give out personal information on these sites and be aware of what they can promise you…because you won’t get it. I know of scams like the following two, because I have had people contact me to ask if I think they’re legitimate…and of course they’re not BUT they appear so in the beginning. The first one is where you see an ad in Gumtree that somebody is giving away a Pomeranian. Their reason is that a family member has passed away and the dog was that person’s pet. They don’t want that constant reminder. To make the scam more convincing, the person sends lots of photos and emails. They refuse to communicate by phone. By doing all this, they put you off guard. Eventually it comes out that they live four hours by plane from where you live. They ask that you only pay for the transport by plane. You agree and are ready to pay. Then you get another email supposedly from the “airline” instructing you how to pay because their account is not currently available. Then they say to use Western Union. Then another email comes, telling you to make the payment to somebody with a foreign name in Africa. (This could be anywhere, of course) Lucky you didn’t make your payment. Another scam using Gumtree is one where the owner is supposedly working on an oil rig but this isn’t mentioned initially. After lots of emails back and forth, the oil rig news comes out. The person says she can arrange for the freight of your new puppy if you’ll just pay the shipping cost. She wants payment through Western Union or Money bookers or some other shady payment method that’s virtually untraceable. Obviously you refuse. 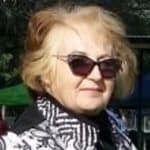 Some shady scammers set up a fake profile using information from a reputable breeder and they make it seem that their page IS the real breeder. This scam has happened at least three times just in Australia. There are other tactics that are used by scammers. They don’t like talking on the phone as they often have heavy accents and their English isn’t good. If they get your money because you do pay into Western Union, you won’t hear from them again. The email will bounce. The ad will disappear. If they gave you a contact number, that will be disconnected or off permanently. Scamwatch has advised that the people running these scams are almost always from a foreign country. A recent ad that appeared on a classified ad site had an adult female for sale. She was ready to be mated. The ad seemed to be on behalf of a legitimate breeder who had bought the dog as a puppy but now didn’t want her. A mobile phone number was also listed so they had several conversations. The scammer even gave the “victim” the website of the breeder to help convince the “victim” to pay. After checking the site out and falling in love with the dog, the person was keen to get a bargain and paid the requested $1000 deposit. After the payment was made, the site disappeared, the ad disappeared and the mobile number wasn’t active. The purchaser contacted the breeder and asked about the breeding and sale of that dog. Sadly, that was too late. The breeder didn’t have a 12 month old dog and the quoted price was $1500 higher than what the breeder charges. Another scam is to just ask for payment to cover shipping but the dog would be free if you had a good home. After you have paid for shipping, the scammers then will try to extract more funds from you by telling you that the dog can’t be shipped without you also playing for insurance. They’ll even be so brazen as to give you the time and date to collect the dog…which, of course, never turns up. They sometimes give you the pet transport company name and the person to talk to about it. What Can You Do To Avoid Online Puppy Scams? If you have any doubts about making a purchase, no matter how appealing, ask for the breeder’s address and registration number. Then contact your kennel club and check it out. 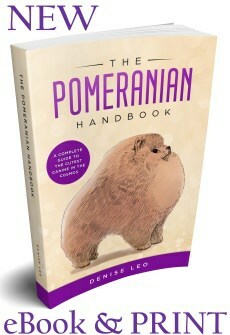 Contact the Pomeranian Club as well. Ask if they know the breeder. It’s essential that you either talk to the breeder by phone or, if possible, visit the premises. Request photos of the puppies at different ages. Check that they match the more recent shots. Look for any specific identification marks such as carpet colour, markings, birthmarks and rings on the fingers. Request to collect your puppy in person and if that can’t happen, don’t spend your money. Remember this old saying… if it’s too good to be true, then it probably is. The lady then received an email advising the puppies have been sent to the transport company, and transfer the money. ACCEPT GREETINGS FROM THE STAFFS OF THE XXXXXXX SHIPPING INTERNATIONAL AGENCY,….ONCE YOU ARE THROUGH WITH PAYMENT JUST USE YOUR PHONE AND TAKE A SNAP SHOT OF THE PAYMENT … AND PROCEED WITH TRANSPORTATION AND DELIVERY TO YOUR HOME ADDRESS.